What are the options for an extra bed in the room? We have a limited number of extra beds which we can put in some rooms. Costs are € 30,00 per night and you need to reserve this in advance. Can we have a baby cot in the room? Yes, we do have a limited number of baby cots available. You can use these for free. Please indicate when booking that you wish to use a baby cot. Do I get the lowest prices on this website? Yes! We have the lowest prices and should you see a better price elsewhere, please let us know and you will get the same price when booking directly with us! All our rooms have bed linen, towels and a bath room with shower and toilet. Do I need to give you my credit card details? No, this is not obligatory. We do ask for your credit card details to guarantee a late arrival after 18.00 hours. 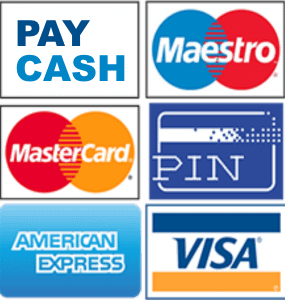 You can pay cash in Euros or with Maestro, Mastercard, VISA or American Express. Can invoices be paid by a third party? Ofcourse! We can send you a pro-forma invoice, so you can have the payment done by a third party prior to arrival. Our hotel offers a limited number of parking spaces for our guests. We do not take reservations for these. Parking costs are € 15,00 per night. Please ask your receptionist upon arrival if there is a space available. When our own parking space is not available, we can offer you a reducation card for the Q-Park Rademarkt. You will pay €18,50 instead of € 23,00 per 24 hours of parking. How do I get to the Martini Hotel? You can reach us by public transport. The bus stop Zuiderdiep is in front of the hotel. From the central station of Groningen there are several bus lines you can take. Please check www.9292.nl for more information. The central station also has a taxi stop. Click here to see how you can reach us by car. Checking in is possible from 14.00 hours. If I arrive early, can I leave my luggage with you? Ofcourse! We have a locked luggage room near the reception desk. No, we do not accept pets. Except for assistance dogs ofcourse. Am I allowed to smoke in the hotel? No, our hotel is a non-smoking area. Do you have free Wi-Fi available? Yes, we do. And you can use it throughout the hotel, the bar and the restaurant. Does the hotel room have a hair blower? No, but we can lend you one for free from the reception desk. Does the hotel room have a safe? No, valuable items can be given to the receptionist who will put them away in our own safe. At what time does the hotel close its doors? You can leave and enter the hotel 24/7. Should the front door be locked, then you can ring the intercom to contact our staff member. Is there always some available? Yes, we have a reception that is open 24/7. Until what time can I check out? You can check out until 12.00 hours. Upon availability you can book a lazy Sunday at the reception desk for only € 15,00. Can I leave my luggage with you after checking out?